Take your parenting skills to the next level with the ultimate transportation option: the 2019 Dodge Grand Caravan. This well-equipped minivan has everything you need to transport precious cargo, including three spacious rows of seating, the latest tech features, and innovative safety extras that will keep your family safe. You don’t have to sacrifice power just because you’re driving a minivan. 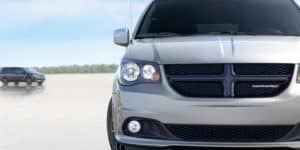 The 2019 Dodge Grand Caravan comes equipped with a 3.6-liter V-6 engine that produces 260 pound-feet of torque and 283 horsepower. It works with a six-speed automatic transmission. The steering wheel is easy to maneuver and responds quickly. The minivan has excellent handling, whether you’re navigating busy city streets or taking it on a long road trip. When properly equipped with the available Trailer Tow Group package, this model can tow up to 3,600 pounds. This package includes a wiring harness, a hitch, and a load-leveling feature, a feature only available on the GT trim level. Every 2019 Grand Caravan has an auto-dimming rearview mirror, a rearview camera, anti-lock brakes, stability and traction control, and air bags placed throughout the cabin for safety. With the top GT trim level, you can also add the Safety Sphere Group package, which comes with rear cross-traffic alert, rear parking sensors, and blind spot monitoring. Even the base model of this minivan comes well equipped with the needs of your family in mind. Features include tri-zone climate control with rear air vents, remote locking and unlocking, a tilt-and-telescoping steering wheel with integrated audio controls, a bench seat in the second row that takes the seating up to eight, full power accessories, and a conversation mirror. As you move through the higher trims, you can get features like captain’s chairs in the second row, which can fold completely flat into the floor, heated second-row seats, upgraded cloth upholstery or leather upholstery with suede inserts, sunshades in the second and third rows, black interior accents and power-adjustable, heated front seats. Your family will also enjoy staying connected while on the go. This model comes equipped with a number of technology features. The base model has a USB port, satellite radio, and Bluetooth connectivity for phone and audio. The SE top GT trim level adds a driver information central display screen, navigation, a 115-volt household-style power outlet, and voice controls. An optional rear-seat entertainment system can take entertainment in your minivan to the next level. It includes a 9-inch overhead display screen, a 115-volt outlet, satellite radio, and an HDMI input. From the outside, the 2019 Grand Caravan looks nice, showing off heated side mirrors and 17-inch steel wheels on the base model. You can get larger or alloy wheels, automatic headlights, black exterior styling elements, fog lights, chrome exterior trim elements, roof rails, and a body-colored grille if you choose one of the higher trims. Test drive the 2019 Dodge Grand Caravan at Westgate Chrysler Jeep Dodge Ram to see how it stacks up against other minivans in the segment. With high-end standard features and elements designed to improve flexibility, parents love the Grand Caravan.